The Skinny: This rare UFO-branded film possesses many trademarks of that company's famous mid-nineties output...which isn't necessarily a good thing. There's some charm and even some decent emotion to be found in It Had To Be You, but the sum total of its parts is barely above average. Ekin Cheng and Karena Lam show good chemistry, for what it's worth. Ekin Cheng and Karena Lam are sparring would-be lovers in It Had To Be You, an urban romantic comedy from the long-missed United Filmmakers Organization (UFO). 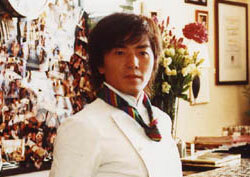 Once upon a time, UFO made it their mission to create intelligent Hong Kong movies about people and relationships, and not kung-fu action epics starring a variety of now-retired actors and actresses. The plan worked, but since HK Cinema is now largely composed of movies about people and relationships, the sudden appearance of a UFO-branded film brings higher expectations. Certain signifiers do need to exist: urban trappings, upscale characters, and slightly overdone existentialism among them. However, given UFO's past pedigree, the movie also has to be good. Hell, given the current state of HK Cinema, it NEEDS to be good. Anything less would be a disappointment. 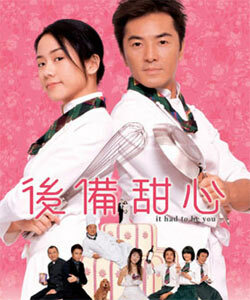 Jack (Ekin Cheng) and Jill (Karena Lam) are partners at workand on the short end of the relationship stick. Though the two meet and spar in grand screwball romantic comedy style, this pair of attractive would-be lovers shares an unfortunate romantic situation: both qualify as "the other guy/girl." In Jill's case, she's stuck in a backup relationship with bohunk doctor Chi On (Hu Bing, who looks like a thicker, studly version of Tony Leung Ka-Fai). She knows she's the other gal, but deep down she's sure that Chi On will come around and make her his one and only. Meanwhile, Jack is still smarting over the revelation that longtime gal Bobo Chan is seeing a bohemian airline pilot (Hayama Go). Actually, she was seeing him BEFORE she started seeing Jack, a factoid he was unaware of until only recently. Jack and Jill may start off not liking one another, but given their shared romantic plight, they have to be made for each other, right? Of course they are! However, we're the audience, so we know that already. In the heavily glossy world of It Had To Be You, Jack and Jill are completely unaware of their obvious heaven-made match. Hell, even their coworkers know, as does Jill's mom, Jack's uncle (Hui Siu-Hung, appearing in his 100th film since 1998), and probably the guy running the popcorn stand at the local theater. But that's the rule of these glossy romantic comedies: you know the two are getting together, so it's the "how" that makes the difference. Some animated misdirection, some feisty sparring, and a couple of missed opportunities are enough to get any audience primed for the inevitable romantic pairing. So do writer-directors Andrew Loo and Maurice Li deliver? The waffling, passive answer: not really. Though it looked to be promising, It Had To Be You is only average for a romantic comedy, and definitely disappointing for a UFO-branded film. The "how" is supposed to be the meat and potatoes of romantic comedies, but the "how" of It Had To Be You is less interesting than the "who" and "where"not the ideal formula for this genre. The "who" is fine: Ekin Cheng is a likable romantic lead, and he shows a more mature charm than in his previous romantic roles. It used to be that Ekin Cheng's romantic screen persona was a grown-up kid who suffered from arrested development; in It Had To Be You, he appears to be a likable, decent guy who really wants to find the right girland actually makes a couple of cheer-worthy choices to get there. Karena Lam is Karena Lam, meaning she's lovely and oh-so-adorable, and probably enough to get any heterosexual male to sit up and pay attention. As for the "where", the two inhabit the attractive urban streets of Central, which is where Casa Nostra, their shared workplace, is located. A homey Italian joint, Casa Nostra has delicious-looking food, coffee that's described in a surprisingly tasty manner, and nice, likable employees (including the spritely Yan Ng, last seen in Crazy N' The City). It's also located right off the Midlevel Escalators, meaning it's easy to find if you're in Hong Kong and looking for a classy joint to snag some grub. 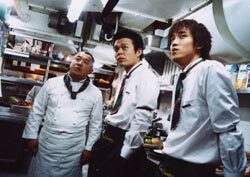 Make some reservations and I'll see you there, though neither Karena Lam nor Ekin Cheng will be around to satisfy your star-gazing, star-stalking, or star-bashing desire to take on Chan Ho-Nam in an impromptu bar brawlor Italian restaurant rumble. You'll have to make that date on your own. But I digress. The fact that I can go on and on about everything but the film itself should tell you what you need to know: It Had To Be You is recycled stuff which looks and seems like it should be a good movie, but unfortunately isn't. Jack and Jill do grow closer in a relatively pleasing manner, but the filmmakers resort to some out-of-nowhere pathos of the urban UFO variety to make an impact on the audience. At a pivotal moment, Jack and Jill must tend to pal Jason (Eric Tsang, doing his usual UFO supporting actor thing), who shares an offbeat and completely manufactured secret that's supposed to be touching, but seems more hackneyed and convenient than anything else. 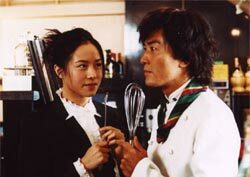 Jack and Jill also mouth the words to a Faye Wong song at the exact same time, which is supposed to indicate a sort of unspoken closeness, but the moment comes off as jarring and cloying instead. To top off all the obvious romantic comedy devices, Jill walks an imaginary dog and talks to it as if it existed. The effect is supposed to be endearing, but Jill ultimately seems more loopy than lovable. When you have a star like Karena Lam, you should find more for her to do than recycle Meg Ryan's greatest hits. At the very least, Ekin Cheng is more attractive than Billy Crystal, but Cheng probably would be a lousy Academy Awards host.